My Wandering Life: Happy Birthday Dr. Seuss! 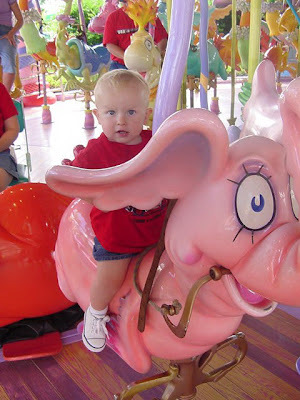 Here is 14 month old Benjamin riding the Caro-Seuss-el in Seuss Landing at Universal Islands of Adventure in Orlando, FL. This is by far the coolest theme park on the planet (and I say this as someone who has experienced quite a few theme parks, all over the planet). If you get the chance, go. In the meantime, you can celebrate the birthday of Dr. Seuss with some green eggs and ham and a rousing reading of If I Ran the Circus, which is crazy fun on the tongue! If I Ran the Zoo is my favorite Dr Seuss book!!! Still have my copy from when I was a kid!! Hey, we were there! Yay!!! Clay & Heidi agree that it was one of the best, if not the best, theme park on the planet.